Antique Limoges France Open Sugar Bowl. 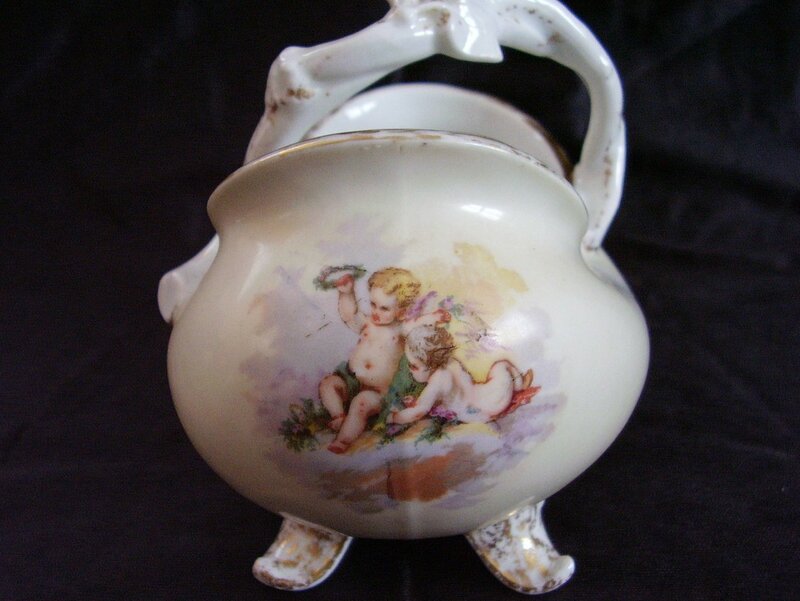 It is a chubby little bowl with the chubby little cherubs and that it was just a perfect match! One part compliments the other. 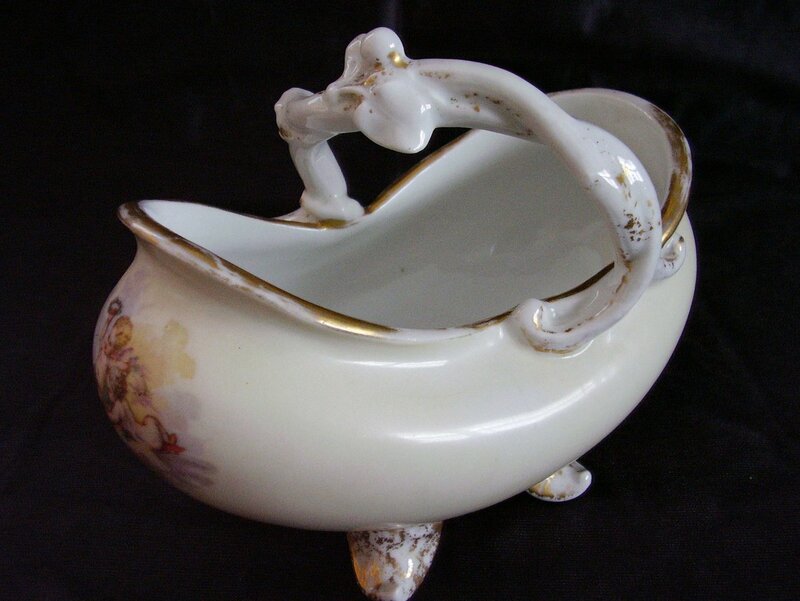 A beautiful antique Limoges France Open Sugar Bowl. We picked this up at an estate sale some time back. What got our immediate attention was the cherubs on each side of the bowl. 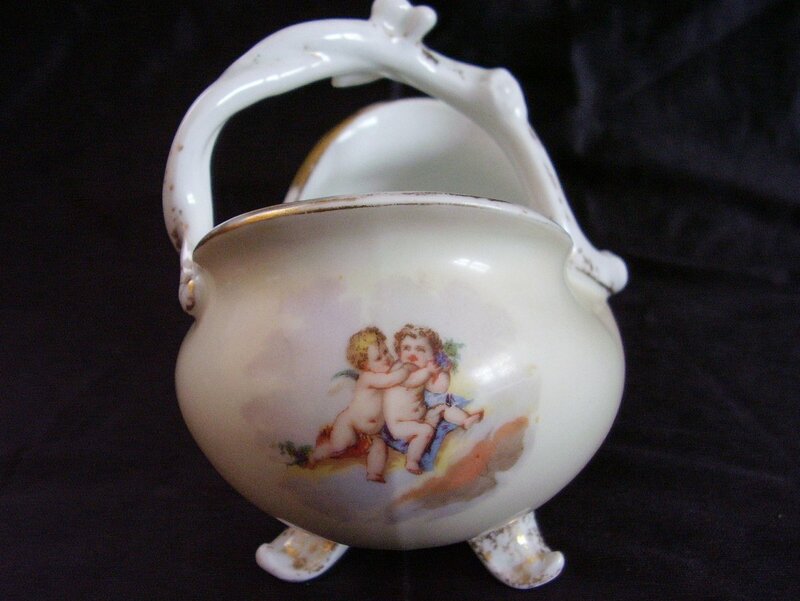 It is a chubby little bowl with the chubby little cherubs and that it was just a perfect match! One part compliments the other. 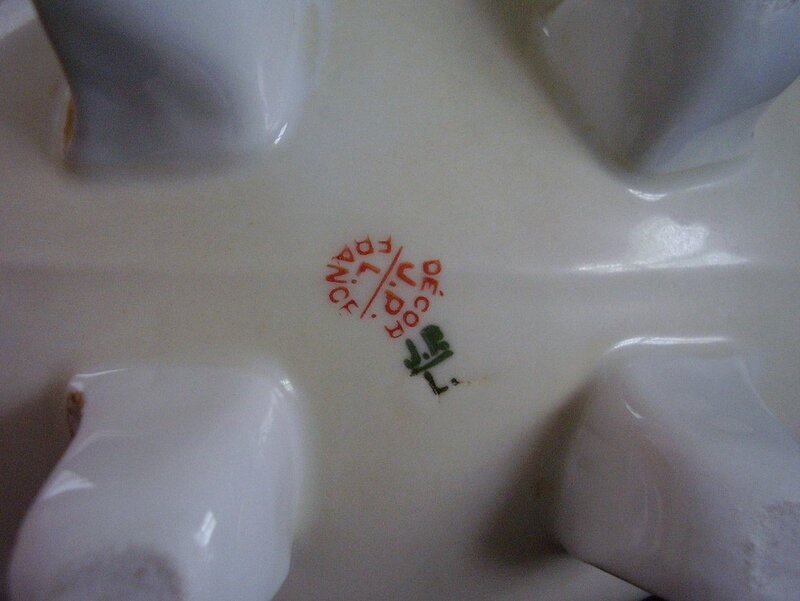 Manufactured by Jean Pouyat, Limoges France this porcelain sugar bowl has the factory applied transfers. I would say that considering its age it is in very good condition. Marks 3 (green) and 4 (red) both are indicative of a manufacturing date of 1876 to 1890. So you know what you are investing in here's what we find on this piece: No cracks, no chips, no fleabites. Significant gold loss as evidenced by the photos. The handle, feet and rim were trimmed in the gold at one time. There are no hairlines. On the inside of the bowl, there is a line. This is not a fracture, looks like a manufacturing defect that has slightly discolored with age. On the outside near the handle there is a very faint pencil line, about 1/2 inches long, definitely is not a hairline, again looks like the porcelain was made like that. The decals appear to be intact and bright. On the one end, the little cherubs are playing nice, looks like one is building a wreath of flowers for the other. Yet on the other end they are battling over a bunch of grapes. The tiny, miniature details of their faces are fantastic. The more we have looked the more we find such intricate details as what appears to be a small bird on one cherub's outstretched arm, the tiny fingers, feathers on the wings, the skin wrinkles etc. The open sugar bowl measures 5 5/8 inches tall at the handle. The actual bowl measures about 4 1/2 inches wide by 7 inches long. The bottom bears the green ink stamp J.P / L. and the red ink stamp Decor J.P. /L. France.